This is the one of the most delicious recipes from my mother’s kitchen. It is simply yummy and is a must have at iftar parties... It can also be had for breakfast or as an evening snack. Boil 5 cups of water with 2 tsp salt. Then switch off the gas and add macroni. Keep the lid closed for 10 minutes. The macroni would have cooked by this time. If not let it be in the hot water for some more time. Once done drain the excess water and set aside. Then heat oil in a a pressure cooker. Add cardamom, cinnamon and onions. Cook for some time. Then add garlic paste, sauté for some time, and then add ginger paste, red chilli powder and tomato paste. Then add kheema, coriander and mint leaves. Mix well. Then add 1 cup water and 1/2 tsp salt. Close the cooker and cook for 10 minutes. Then open the lid and add lime juice, cook till boils appear. Then add the cooked macroni. Mix well. 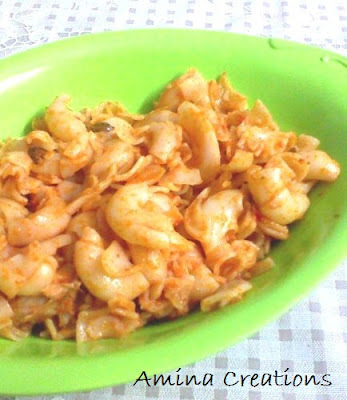 Serve hot .It is a dish in its own right so it does not require any side dish.